He was one of the greatest writers who ever lived; I’m a writer. But then there are some not-so-obvious ways in which we differ, too, and I discovered those while reading The Paris Wife by Paula McClain last week (which I loved). For those of you who haven’t read it, it’s told from the POV of Hemingway’s first wife, Hadley Richardson. Kristan Hoffman wrote two posts that will make you want to read it. But I don’t want to discuss the book. I want to discuss Hemingway and all the ways we differ. I lived in Paris during my late teens/early 20s, and I read A Moveable Feast, Hemingway’s autobiography about his years there, during that time. The only scene I remember from A Moveable Feast was one in which Hemingway discreetly bends over while sitting on a park bench to break the neck of a pigeon, so he can take it home for his wife to cook for dinner. They were that poor. But A Paris Wife paints a very different picture. Although McClain acknowledges that the Hemingways lived a modest lifestyle in comparison to some of their wealthy friends, like Scott and Zelda Fitzgerald, that modest income was comparable to about $40,000 in today’s dollars, which went a LONG way in France in 1925, when one dollar could buy 22 francs, and their cleaning woman, Marie Cocotte, charged 2 francs per hour. That means for $.09/hour, or $1.17 in today’s dollars, Marie Cocotte not only did their dishes and prepared their meals every morning but came back most afternoons to prepare their dinners as well. When Bumby, the Hemingways’ first child, was born, Marie Cocotte frequently took care of him, often staying late into the night and sometimes spending weeks at a time with him in Paris, in the South of France or in Brittany while the Hemingways were off skiing in the Alps or watching the fiesta in Pamplona. I can’t help but think how much writing I could get done if I, too, had a cleaning woman/nanny taking care of my children and cooking me gourmet French meals for $1.17 an hour. Sure, I’d have to put up with cold showers, a lack of heat, and stinky squat toilets down the hall from my tiny apartment. It would be a lot like the trip I took to India in the 90s, only without the giardia and other intestinal parasites that left me writhing in pain every week or two. But wouldn’t it be worth it to finally write that Pulitzer Prize-winning novel? (If only the Pulitzer board were still giving out prizes for novels.) To finally win that Nobel prize? Now that Europe is more expensive than the United States, I’m thinking Honduras might be the place, or Bali. We could start a new ex-pat generation without all the absinthe and bullfights. A few smoothies, a little yoga, and I’m sure plenty of drama would ensue. Who’s in? I’ll meet you on the beach at sunset, where I’ll be working on my next novel: The Sun Also Sets. Ha – I like Hemingway, but man, Hadley needed to learn to stand up for herself. Maybe it wouldn't have helped, but when she let Pauline come to the South of France with them, I wanted to hit her over the head. I do love Flannery O'Connor, though. Love this, Meghan. Would love to read more by you about your reading & your life in Paris. Can't wait for that memoir! Lindsey, every week I mean to write more about Paris and about modeling and about teaching my kids French, etc. but the weeks go by so fast. I'll keep trying, though! And lol, yeah, their idea of poor didn't strike me as so terrible… I'd LOVE to be an ex-pat somewhere. I think SE Asia is kind of the place right now, b/c it's gorgeous and affordable. But I don't think Andy would enjoy it as much as I would. Hasn't everyone who wanted to be a writer wanted to live in Paris like Hemingway? The trouble is, it's the Paris of the twenties that I dream of — Sylvia Beach and James Joyce and Scott Fitzgerald and Gertrude Stein — that whole Moveable Feast milieu. Alas, that died a long time ago. So true, Steven. I wonder if there's a place in the world like that now – full of amazing writers (Iowa? :). Costa Rica is wonderful, but I'm not sure it's the cheapest country to live. Fantastic surfing, though. I'd go back any day. Never knew that about Hemingway. Reminds me of Thoreau, who they said used to walk home at times for dinner before going back to his cabin. Sorry, mainecharacter, I'll be at the beach 🙂 My book club chose A Moveable Feast next, so I'll get Hemingway's side of the story soon and report back. Excellente — does a good life always depend on having poor people of a lower class wait on you? Unfortunately it seems it does. Hi Jane – I don’t think that people working for other people necessarily have to be from a lower class, though. I worked as an attendant for a disabled woman on weekends while I was working as a newspaper reporter 9-5 M-W because I wanted to make extra money, and our current babysitter makes more per hour than I did at either of those jobs. I think oftentimes college students or people who just want to make extra money take up jobs as babysitters, attendants, etc. But it’s true, many of them are from a lower class, and I guess I was in that lower class, too, as a journalist. I’ve also done a lot of tutoring for people who are much wealthier than I am. But yes, unless you have help from family, like people did in the old days, it’s difficult to lead anything less than a crazy life while taking care of little kids and trying to work and write. There’s always daycare, but is that a better solution than hiring someone to take care of your kids? Is daycare less elitist? I guess it is. Meghan. You make a good point. Class does not necessarily mean you'll be or won't be providing services to others. But I think most of the time its class as money goes with class. A person needs money to hire the people. Also, as part of our concept of class, we only respect certain kinds of work, and will only pay premiums for the work we respect. Not only is serving others not considered worthy of respect, working with children, even if you are a parent, isn't considered being worth any money. The Hemingways were acting as most people in their class would. i love this post- its SO funny (and telling) – what is it about success and jerks (a lot of REALLY amazingly talented and successful people I know (of) are also jerks – .. WHY?????? I think you have to be really selfish to shut out your family and friends and all their wants/needs to just focus on your art. If you want to be a good writer than do a simple trick “just writes”. As you write and write for a long time, you will find new ways of writing and learn new essay writing company techniques from your own. As these techniques and tips are your self-created then you will be unique in the market. 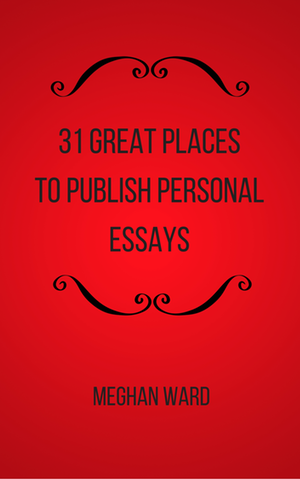 Subscribe to receive a free copy of "31 Great Places to Publish Personal Essays"